I am not one who was born in the possession of knowledge; I am one who is fond of antiquity, and earnest in seeking it there. By touching you may kill, by keeping away you may possess. Allow your softer, more intuitive, and less dominating feminine qualities to rise to the fore, so that you're surrendering rather than dominating, receiving rather than broadcasting, loving rather than fighting. What you are shouts so loudly in my ears I cannot hear what you say. facilitate understanding and working with others to produce creative solutions and solve problems? encourage speakers to keep communicating, to share more and go deeper? prompt your prospects to release their feelings more easily? to make your prospects feel less controlled by you and less afraid of a negative response? Be aware of biases and perceptions. Control your biases and validate your assumptions. One of the golden rules of the therapy profession is that everyone needs at least one person with whom they can openly and unashamedly discuss every little detail – happenings, desires, fears – of their life, whether it is from the past, present, or future. There are other psychological needs – to be accepted unconditionally, appreciated, recognized, respected, desired, valued, approved of, or complimented – that affect the way we communicate with each other. Listen carefully, ask questions to show that you are genuinely interested and you'll be amazed at the spin-offs from becoming a good question asker and a good listener. People appreciate, respect and value others who are great listeners. 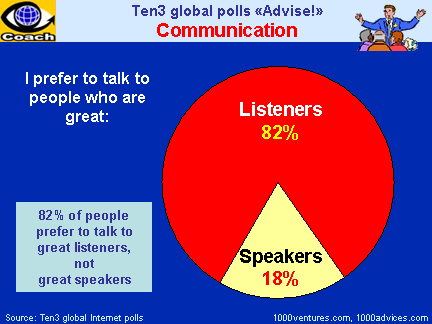 Most people simply listen to the words that are being said to them, but words contain only 10% of the message. 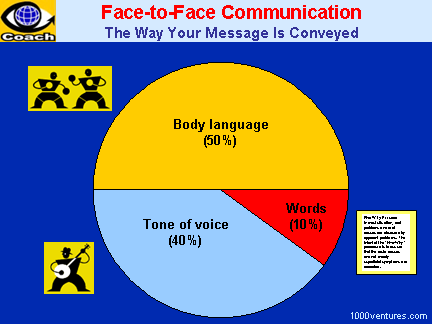 The remaining 90% is hidden in the body language and the tone of voice. Understanding body language can help you look beyond what people say to what they really mean. what's being said is getting in the way of what needs be said. Socratic questioning is at the heart of critical thinking – they enhance your critical thinking skills.